Good Food. Good Causes. A Great Time. 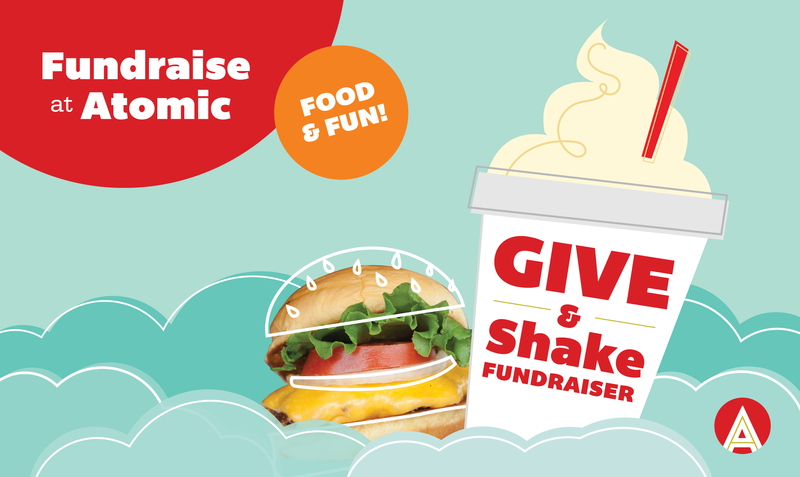 Atomic Burger's GIVE & Shake is an easy (and delicious) way to raise funds for your organization, school, or non-profit. We'll donate 20% of all dine-in and drive thru sales generated by your group and you get to take a night off from cooking dinner. We'll help you choose an evening (Monday-Wednesday) and provide you with promotional materials to rally the troops. The more people that show up the more you'll earn. To see how organizations can promote these events, take a look at our How-To Guide. 20% of sales go to your organization!